DATA NETWORKS 46 E&MJ • NOVEMBER 2017 www.e-mj.com tists looking to build things, but they're not sure about mining. There are other analysts trying to create solutions, but they don't know how the industry works. That's where we come in." Next-gen Networks Underlying the industry's critical need to "get it right the first time" by applying useful analysis to timely information is the development of increasingly sophisti- cated and flexible data network solutions. The latest generation of data networks, as illustrated by Innovative Wireless Technologies' (IWT) HDRMesh solution, include wireless packages that reliably carry real-time data from working areas to enable effective management and im- provement of production operations. IWT said HDRMesh was specifically designed for underground use and solves data retrieval issues facing that type of op- eration. Traditional Wi-Fi-based solutions do not reliably transmit in non-line-of-sight conditions, and lack the range for continu- ous coverage. Traditional wired data solu- tions are difficult to maintain, difficult to advance and often do not survive the min- ing process. IWT's data solution comprises a series of rugged High Data Rate (HDR) wireless nodes that "hop" data from mine equipment to the mine's fiber backbone. Each node contains a proprietary high data rate mesh component and a Wi-Fi Client Access Point. 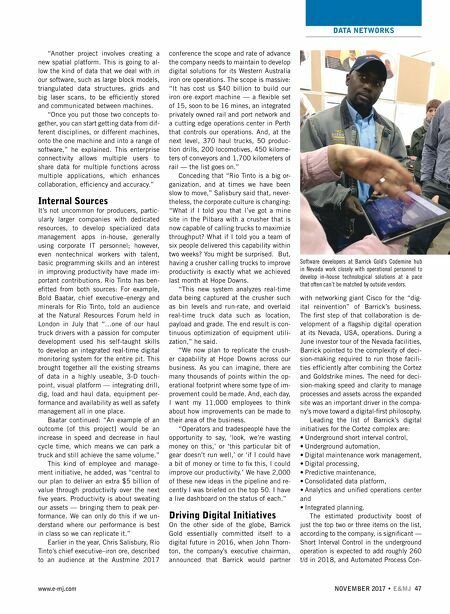 Eric Hansen, IWT's CEO, spoke with E&MJ earlier this year at a trade show just prior to the commercial rollout of HDRMesh. Hansen said the system had been tested in three different mining envi- ronments and the first operational installa- tion would occur before the end of 2017. Hansen traced the evolution of HDRMesh from the success of the compa- ny's existing underground communications solutions. "Our legacy systems introduced prior to HDRMesh were designed to meet the requirements of the 2006 MINER (Mine Improvement and New Emergency Response Act) in the U.S., which focused mainly on communications and miner safety. However, we started getting com- ments from our customers on how much of an impact just having those communi- cations capabilities available had on over- all productivity — they were able to talk with underground workers they could never reach before, and respond to underground problems and bottlenecks much quicker." HDRMesh is designed to accommo- date the growing need for data transmis- sion beyond the basic needs of commu- nications, Hansen explained, as mines ramp up data collection from video sourc- es, machine-mounted sensors and other information nodes. It was also designed to be easier on the checkbook: "It is available in two configurations — a stand- alone version for customers who do not have one of our legacy systems installed; and a retrofittable version for those that do," said Hansen. "It doesn't require fi- ber optic, Ethernet or leaky feeder cabling and thus doesn't have the maintenance requirements associated with those sys- tems, but still works with traditional com- munications client devices such as smart- phones, tablets and laptops." IWT's Vice President of Engineering Steve Harrison added that the freedom from cabling is a distinct cost advantage in hard rock applications. "You can take our equipment into a mining area, use it and remove it for blasting or when mining is completed — you don't have the cost of traditional cabling that's been installed and then damaged or abandoned from mining activities." Hansen said IWT also is developing a suite of data-analytics software tools that will complement the high-speed data HDRMesh network, providing customers with real-time information from under- ground operations, enabling them to make quicker and more accurate decisions. Other data-management software solution suppliers are plotting their fu- ture avenues for product development and engaging their clients in the process. 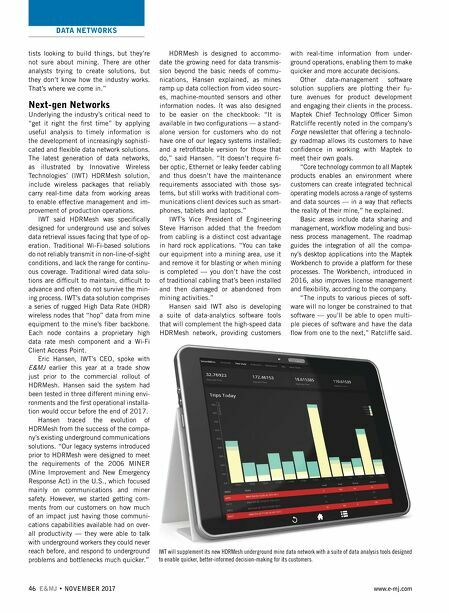 Maptek Chief Technology Officer Simon Ratcliffe recently noted in the company's Forge newsletter that offering a technolo- gy roadmap allows its customers to have confidence in working with Maptek to meet their own goals. "Core technology common to all Maptek products enables an environment where customers can create integrated technical operating models across a range of systems and data sources — in a way that reflects the reality of their mine," he explained. Basic areas include data sharing and management, workflow modeling and busi- ness process management. The roadmap guides the integration of all the compa- ny's desktop applications into the Maptek Workbench to provide a platform for these processes. The Workbench, introduced in 2016, also improves license management and flexibility, according to the company. "The inputs to various pieces of soft- ware will no longer be constrained to that software — you'll be able to open multi- ple pieces of software and have the data flow from one to the next," Ratcliffe said. IWT will supplement its new HDRMesh underground mine data network with a suite of data analysis tools designed to enable quicker, better-informed decision-making for its customers.